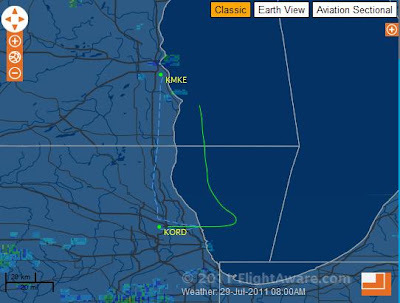 This morning featured a welcome change of pace: the typical early-morning cycling jaunt to the local coffee shop was replaced by a quick hop into O’Hare with Skywest. To be clear, I adore my 6am cycling sprints down deserted streets for fresh-brewed coffee. Yet, it’s been several weeks since my last full-throttled acceleration down a runway, and today’s morning satiated my hunger. The day began perhaps an hour earlier than most other weekdays. Some twenty minutes after a 4:15a alarm interrupted my dreams, I was beginning the approximately 75-mile drive to Milwaukee’s Mitchell Field, from which a Bombardier aircraft would shuttle me to Chicago’s O’Hare. Where was I coming from? Ah yes, the northwest side of Chicago, a stone’s throw from my flight’s destination, O’Hare. A quick explanation is in order. United Airlines, in accordance with common industry practice, publishes dearer airfares on nonstop routes than on connecting ones, particularly when the one-stop itineraries touch a market with spirited competition (as is the case with Mitchell Field). In planning this day’s trip to New York, I compared the comprehensive value of a no-hassles nonstop from O’Hare against that of a Milwaukee origination and selected the latter. Thus, I was sprinting to Mitchell Field in the early morning, arriving under an auspicious, orange-tinged sky at the pregnant hour of 5:30a. The run-through of airport formalities was delightfully well-greased – Easy Checkin machine for my boarding passes, an inquiry at the ticket counter for a standby card that was expeditiously and pleasantly granted, a no-wait priority security lane for the first act of the day’s security theater, arrival at the gate to coincide with the commencement of boarding. Push-back occurred in a punctual manner, and I enjoyed some moments of relaxation. Indeed, I had just enjoyed the good fortune of arriving into my window seat with neither the stress of cutting it too close nor the disappointment of being too early and waiting. Moments later the flight deck crew applied take-off power, and we were off! Skywest enjoys the well-earned reputation of superior service in the class of regional carriers, and my morning flight was an emphatic affirmation of this perception. No sooner had Skywest (d.b.a United Express) 5475 leveled off at a 7,000 foot cruise, indicated by the pilots with a set of four chimes, but the personable flight attendant began the first of several waltzes down the aisle, first with coffee, next with bottled water, finally on the obligatory trash and safety check runs. Naturally, this would be normal behaviour on any flight in Europe or Asia, or on U.S. routes in excess of ~150 miles. Not so on the 66-mile MKE-ORD sector. I was very impressed. Touchdown occurred at 6:44a on runway 27L, and we (the passengers) were entering Terminal 2 via the relatively well-situated gate F2A around 6:50a. After a quick Blue Line journey, I was back to where I started from, three hours later and one additional aviation experience richer.